We’ve all been guilty at one time or other of making an important decision without taking the time to ensure the validity of our choice. Whether it was to save a buck or to shave an hour, our decision to forego research and go with our first option often ends up costing us more money and more time. 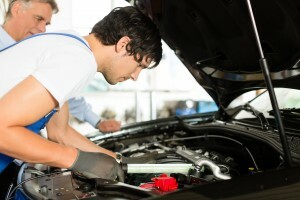 Unfortunately, with the number of auto repair shops in St. Louis, this approach to finding a reputable mechanic can end up doing more damage to your vehicle. Choosing one that is willing to work for a lesser fee often means that they are happy to cut corners and deliver shoddy results. Though finding a trusted auto repair shop can be a daunting task, it helps if you know which questions to ask before leaving your automobile with them. Do you specialize in (your make) service and repair? If you own a BMW, Audi, Porsche or other luxury or performance vehicle, it is vital to its long life that only a certified mechanic work on it. What credentials are needed for technicians in your shop? Model-specific Master Mechanics help to ensure that proper service and repair is being performed. Is your repair shop ASE certified? Being a member of the Automotive Service Association means that the shop you choose adheres to a strict code of ethics and quality care. Do you charge for estimates? Where some centers forego the charge for diagnostic testing, others waive the charge when repairs are made. Others charge an hourly rate for each service. Find out the stipulations before leaving your vehicle to avoid any nasty surprises. Can I choose between new and used parts? Know what you are getting into with this option, but many auto repair shops allow you to enjoy the savings available when using used parts, however, it is not recommended on many luxury import autos. Get good advice from professionals before making any decisions regarding parts. Are there payment options available? Many import auto repair shops offer financing options on larger repair costs to help customers shoulder the blow. What service guarantees do you offer? You should look for one that guarantees their work for 12 months or 12,000 miles or more. Do you offer a courtesy car to customers? If a courtesy car is not available for use, find out if they have a shuttle service. As St Charles’ leader in import auto repair, specializing in BMW service and Porsche repair, our technicians are skilled experts that understand the value of unmatched customer care. We are the Top-Rated Local® auto repair in St Charles because of our commitment to excellence and our passion for luxury and performance automobiles. Find out why so many car enthusiasts are choosing us as their first choice in automotive service and repair by scheduling an appointment with us now.